Yes, the DRA is now three years old! And what a wild ride it’s been! In August 2013, we filed as a non-profit corporation with the State of Oregon. We started on a shoestring budget, which consisted mostly of contributions from members of the Board of Directors. In January 2014 we sent out our first fundraising appeal. It was far more successful that we had imagined it would be. To those donors, who recognized the need our mission addressed, we wish to thank you. Your trusted us when we had no track record. To the members of the Founding Circle, we would like to offer special thanks. From that beginning, we have maintained a spirit of frugal but effective activism. For most of our existence, including the present, we’ve had only one paid employee. We have no offices. We’ve kept our overhead low. We contract out services as needed. What we do have is excellent water quality monitoring equipment. We have board members with scientific expertise and experience. We have an outstanding legal team. And we have a passionate desire to protect the lower Deschutes River. Larry Marxer and intern Cory McCaffrey calibrating our data sonde. Photo by Greg McMillan. Beginning in 2011, as the Lower Deschutes River Coalition (prior to becoming the DRA), we conducted meetings with Portland General Electric. These meetings included data presentations and roundtable discussions of the problems being seen in the lower river by guides and recreational users. We began sampling and photographing aquatic insects and algae in 2013. In collaboration with PGE, we established a water temperature-monitoring array in 2013. DRA Board member and renowned aquatic entomologist Rick Hafele designed an adult aquatic insect hatch survey to gather data on hatch timing and densities. That study continues on an annual basis documenting changes in hatches on the lower Deschutes River. Rick is also managing our ongoing benthic aquatic insect-monitoring program. Neither PGE nor the resource agencies are monitoring aquatic insects at this time. Rick Hafele providing training for adult aquatic insect hatch observers. Photo by Greg McMillan. In December 2013 we held a science-planning meeting with multiple agencies and PGE. Our science plans have been a product of that meeting. In July 2014, we did a three-day (72 hour) water quality monitoring synoptic at five sites (most of them remote) on the lower Deschutes River. We conducted a second three-day water quality monitoring synoptic at three sites in August 2014. We contracted with Quantum Spatial to conduct thermal imaging of the lower Deschutes River and the area around the three dams of the Pelton-Round Butte Complex. We attempted to collaborate with PGE on a water quality study in Lake Billy Chinook and the lower Deschutes River. The initial planning meeting was cancelled by PGE without follow-up. In January 2015, we submitted objections regarding the Low Impact Hydropower Institute’s certification of the Pelton-Round Butte Hydroelectric Complex. By spring of 2015 we were starting our own algae and water quality study on Lake Billy Chinook and the lower Deschutes River. That study continues today. Cost of equipment and lab fees to date: $30,000. Value of the data: priceless. Larry Marxer installing a Hobo temp water temperature monitor. Photo by Greg McMillan. In the summer of 2015, warm water temperatures in the lower Deschutes River contributed to fish die-offs near the mouth and near the confluence with the Warm Springs River. These events were first detected and reported by the DRA and DRA supporters. In the fall of 2015, with the permission and funding of a private property owner on the lower Deschutes River, we established a monitoring station to perform benthic aquatic insect sampling, continuous water quality monitoring, and photo documentation of algal growth. We then acquired the permission of private landowners to set up a second study site in the Kaskela area. Rick Hafele examines contents of a kick screen on the lower Deschutes River. Photo by Greg McMillan. In September 2015 we gathered the five conservation groups who are signatories to the Federal Energy Regulatory Commission license for the Pelton-Round Butte Complex to discuss the problems resulting from selective water withdrawal. In October 2015 we appealed the Low Impact Hydropower Institute’s certification of the PRB Complex. Conditions were imposed on the certification as a result of our interventions. 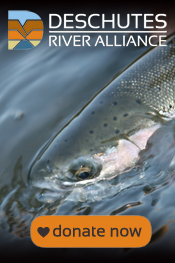 In December 2015 we, along with the conservation group signatories to the PRB license, met with PGE to ask for measures to lower river temperatures when high temperatures pose a risk for fish. This request was denied, and PGE foreclosed the possibility of any future meetings. In spring of 2016, we formed our legal team. We subsequently served Portland General Electric with a sixty-day notice of intent to sue based on water quality violations. This is only a partial list of our accomplishments. These are the kinds of things that are happening at the DRA on a day in, day out basis, and now on a year-to-year basis. Volunteers do much of this work. Rick Hafele examining trout stomach contents. Photo by Greg McMillan. Our next year looks to be more exciting and more productive. Check back here over the next few weeks for announcements! In the meantime, we appreciate all of the support shown to us in the past three years. To all of you who have donated, volunteered, or otherwise supported us, thank you! With your support, our combined passion and love for the river will accomplish great things. It was with great sadness that we learned of the passing of Doug Robertson, a longtime advocate for the Deschutes River and for wild fish. Doug was 69 years old. Each person who floats, fishes, or camps on the lower Deschutes River below Macks Canyon should give thanks to Doug. In 1983 the Eastern Oregon Land Company owned most of the lower twelve miles of the Deschutes River. The land was used primarily for cattle grazing, and the banks of the river were totally denuded of any vegetation. Gravel bars over a mile long were the norm. There were few alder trees to offer shade. Doug learned that Eastern Oregon Land Company was interested in selling the property. One potentially interested party was planning on developing a resort in the Harris Canyon area. Doug negotiated an offer to purchase the property, and then convinced then-Governor Vic Atiyeh to provide State of Oregon backing for the offer. Governor Atiyeh asked Oregon Wildlife Heritage Foundation to lead an effort to raise funds to purchase the land. OWHF raised over $1 million of private money, and cobbled together state and federal funding to complete the purchase on behalf of the people of Oregon. The State of Oregon took possession of the property, and streamside recovery began under the management of the Oregon Department of Fish and Wildlife. That stretch of river is nearly unrecognizable from what it was before Doug stepped in. Today, it is one of Oregon’s most treasured recreational assets. None of this would have happened without Doug’s vision and efforts. All of us should be eternally grateful to him. Doug was a dedicated fly angler, and he had a lifelong love for the Deschutes. He and his wife Nan own a cabin above the Locked Gate. Doug was also a longtime board member of the Native Fish Society. There is a monument bearing Doug and Nan’s names at Robertson Point near Harris Canyon. If you stop there, please take a moment and say a heartfelt thanks to a man who made a major difference on the lower Deschutes River. Our sincerest condolences go out to Doug’s wife Nan, and their family and friends.